Engineers on Sunday intentionally crashed a Russian Express communications satellite stranded in space by an August rocket mishap, declaring the mission a total loss despite efforts by a start-up company to purchase the craft to serve the Antarctic research community. The Express AM4 satellite was guided on a controlled descent by engineers at EADS Astrium, the spacecraft's prime contractor. After firing its engine at about 1033 GMT (6:33 a.m. EDT), the 6.3-ton satellite plummeted into Earth's atmosphere, burning up and spreading debris over the Pacific Ocean north of Hawaii. Impact of debris was expected at about 1332 GMT (9:32 a.m. EDT), according to the Interfax news agency. Express AM4 was circling Earth in an elliptical orbit with a high point of about 12,600 miles, well short of its planned 22,300-mile-high perch, where the craft would have provided communications coverage over Russia and neighboring countries for the Russian Satellite Communications Co., the country's state-owned civil satellite operator. Engineers determined Express AM4 did not have enough propellant to reach its operational orbit and still perform its mission. The spacecraft would have served customers with Internet and video services with 10 antennas and 63 active C-band, Ku-band, Ka-band and L-band transponders. With the capacity to generate up to 16 kilowatts of electricity, Express AM4 was the most powerful satellite ever built in Europe. Russia declared the mission a total loss, collected an insurance payout and ordered a replacement satellite for launch as soon as late 2013. But Polar Broadband Systems Ltd. proposed raising Express AM4's orbit to an altitude between 15,500 miles and 29,000 miles. Instead of being stationed over the equator as originally planned, the satellite would be in an orbit with an inclination of 51.1 degrees, placing the craft high in the sky over Antarctic research sites. Such an orbit would provide broadband coverage of the South Pole region for more than 14 hours per day, according to Bill Readdy, a former astronaut, space shuttle commander and NASA manager who co-founded Polar Broadband. Equatorial communications satellites are unable to link up with most Antarctic bases. Readdy told Spaceflight Now the company sent letters to Russian officials, including a request for the Russian ambassador to the United States to intervene to save the satellite. Polar Broadband also contacted the U.S. State Department and John Holdren, the White House science advisor, reaching out for help. Readdy said Sunday calls to the Russian space agency and Express AM4's insurance underwriter went unanswered in the last few days as Russia finalized plans to de-orbit the satellite. High radiation doses to the satellite and the potential risk of a collision with other objects in space were the rationale for the commanded re-entry of Express AM4, according to Readdy. But Polar Broadband said its analysis showed the radiation dose in its planned orbit for Express AM4 would permit operations for at least 10 years. And the risk of collision with another spacecraft was "essentially zero," the company said. The National Science Foundation, which oversees U.S. government research stations in Antarctica, currently relies on aging satellites for communications with polar bases. The GOES 3 weather satellite, launched in 1978, and NASA's TDRS 3 and TDRS 5 relay satellites, launched in 1988 and 1991, are the primary means of communicating with Antarctic researchers. 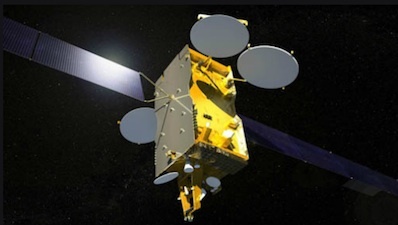 Deborah Wing, an NSF spokesperson, said the foundation is in the process of activating the Skynet 4C satellite for polar communications through an agreement with the U.S. Navy's Space and Naval Warfare Systems Command, which has a contract to use the satellite with Intelsat, the North American provider of Skynet communications capacity. The Skynet satellite network is managed by Paradigm Secure, a subsidiary of EADS Astrium, to provide services to the U.K. military and NATO allies. Before Sunday's de-orbit, Wing said capacity offered by Express AM4 "would represent a significant increase in capability" for the the remainder of this decade and into the 2020s. "Satellite data communications support hundreds of gigabytes of daily science data transfer, quality telephone service, Internet, telemedicine, South Pole Station operations and morale," Wing said. 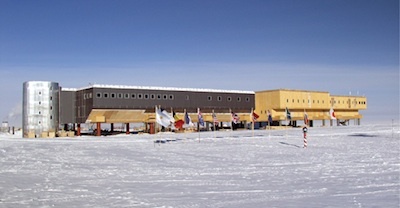 A blue ribbon panel chaired by former Lockheed Martin Corp. executive Norman Augustine is reviewing the U.S. Antarctic program. The committee's final report is due later this year, but members already have noted the need for expanded satellite communications at polar research bases. The National Science Foundation sought input from the commercial satellite broadband communications industry in a 2011 request for information, but according to Dennis Wingo, a Polar Broadband co-founder, none of the responses offered a viable solution under the foundation's limited budget. A dedicated communications satellite would cost between $100 and $500 million, according to Wingo, an experienced engineer in aerospace and computer science. He said the cost of deploying Express AM4 for Antarctic service would have been about $20 million.